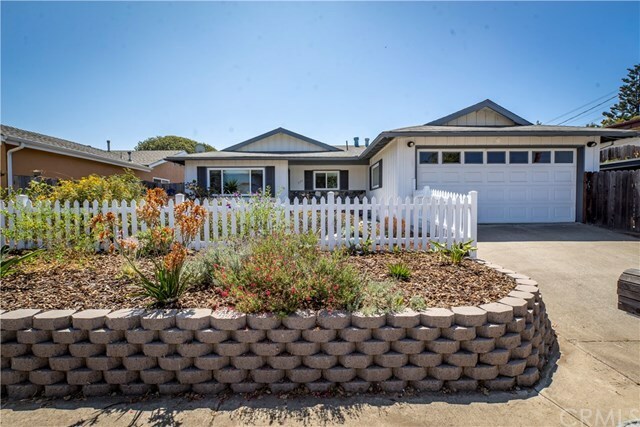 Charming, single level 3 bedroom, 2 bath home in desirable and well established Arroyo Grande neighborhood. This easy to live in home has beautiful updated bathrooms and a great floor plan that flows from a comfortable living room into the kitchen with eat in dining, and onto the family room with a wood burning fireplace. Sliding glass doors off the family room lead to a private backyard patio where you can sit and enjoy the mild central coast weather, garden areas, lemon and orange fruit trees, and lots of area for the kids (or your furry family members) to run and play. You'll welcome the low maintenance, beautiful and easy to care for mature landscaping. Home is centrally located and close to parks, schools, shopping, restaurants, freeway access and a very short drive to the beach. Directions: Grand Avenue to Halcyon, south on Halcyon to Dodson Way, left on Dodson Way.